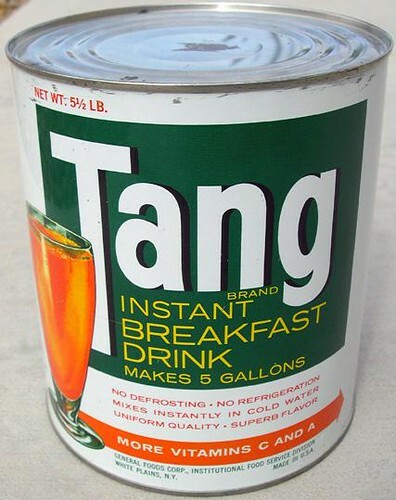 It may be a sky full of bacon, but Tang got to the moon first. If you feel like commemorating this amazing and now apparently irreproducible feat, TCM is showing a bunch of moon movies on the 40th anniversary, which is Monday the 20th. I recommend First Men in the Moon, which is a rather fun Jules Verne pastiche which begins, cheekily, with American astronauts finding a plaque claiming the moon for Queen Victoria; Destination Moon, which was an attempt to forecast in 1950 what a moon mission would really be like; The Mouse on the Moon, a very funny Cold War comedy (sequel to, and better than, The Mouse That Roared); and finally an outstanding documentary, For All Mankind. And of course, here’s the proof it was all FAKED!!! !